After a lengthy reign as Universal Champion, the time has come for Brock Lesnar to relinquish the belt. His reign has been controversial because of his lack of appearances but this plays a huge role in determining who should carry the championship following this championship debacle. There are several superstars who have the talent and experience to be the next flag bearer. There are in ring monsters, technical masters, and aerial specialists who could all bring more legitimacy to the belt. So who should be the next “chosen one”? We know who Vince McMahon wants but who truly deserves the opportunity? The obvious choice is Roman Reigns. Not because that is what the fans or I want but because it is what Vince wants. It really doesn’t matter how good of a performer he is, and to be completely fair, he is an amazing performer. He is blacklisted by the fans because of McMahon’s insisting on putting him in the main events. I have seen online when people defend him because it has been 2 years since he has been champion. I respect that but he has been in the main event nonetheless. Roman was over with the crowd after exiting the Shield but has been pushed so hard that the fans have no desire to see him as the flag bearer. Braun Strowman seems like another natural fit to dethrone Brock Lesnar. He is a massive force in WWE that has been grown organically and the fans are behind him. He is not currently factored into the Universal Title Picture but does hold the Money in the Bank Briefcase. It is conceivable that WWE may have Roman with the championship from Lesnar only to have Braun cash in and win the title immediately afterwards. The other option is for Lesnar to beat Reigns, appeasing the fans, and then having Strowman cash in on Brock to send the Summer Slam fans home happy. I think that would be the better option. 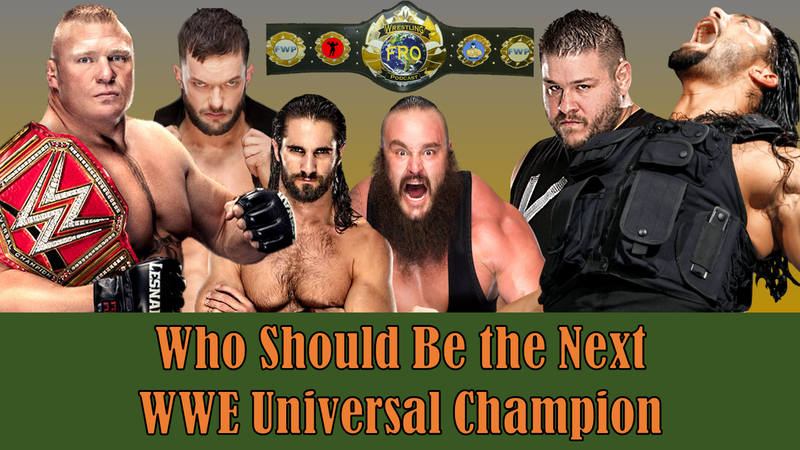 A third option would be for Braun to cash in at the start of the match and cause it to be a triple threat. This would allow either Braun or Roman to take the fall for the other and not defeat Brock in the process. That is only an option should WWE feel that Brock will be returning after his detour in UFC. A new option emerged on Raw as Kevin Owens has been booked in a match at Summer Slam with the stipulation that should he defeat Braun Strowman, he would get the Money in the Bank contract. Should WWE choose to do so, it would be a surprise to the fans but would keep the title on a heel which is something Vince likes to do. He has always felt the chase for the title was the bigger attraction than the babyface champion. People often reference John Cena to argue against that point but remember he is a 16 time champion which only supports the notion that whenever they gave him the belt they took it from him to let him chase it once again. Kevin Owens is a great heel and can get heat from the audience when he needs to. He moves merchandise and is capable of putting on incredible matches. He may beat Braun, cash in on Roman or Brock, and be the next “chosen one”. Seth Rollins has been arguably the most important talent in all of WWE but certainly Raw. He was put in a horrible program with Jason Jordan to start the year. He moved into the Intercontinental championship picture when Jordan was injured and has been putting on a clinic in virtually every match he has been in. Many thought WWE may change course on Reigns and put Rollins in the Summer Slam Main Event. That did not happen When he lost the Intercontinental title and the rematch, it should have been the next logical progression. Unfortunately, that is not what Vince thinks in “Best for Business”. The fans have been clamoring for it and they approve of Rollins. Then again, when was the last time WWE gave the fans what they actually wanted? When Bobby Lashley beat Roman Reigns at Extreme Rules there was a glimmer of hope that they may turn the page on Reigns. It was the first meaningful thing Lashley has done since returning. Then they have him lose to Reigns on Raw and give the championship match to Roman. The only possibility for things to change would be for Kurt angle to change his mind on the main event for Summer Slam and make it a triple threat by including Lashley. Though he has not been back long, Lashley is building a fan base that supports him and defeating both Brock and Roman in one match could be the thing that puts him over in the fans eyes. Several other talents would be well received by the audience. WWE just needs to believe in the fans ability to choose their champion. Finn Balor has yet to get a substantial push that many believe would make sense. Drew McIntyre is clearly an emerging superstar and could be “the man” but he needs more time on the main roster and some meaningful feuds before they hand him a coveted match for the Universal Championship. Other talents would have seemed to be perfect fits in the past. Bobby Roode has been wasted since moving to the main roster. Bray Wyatt has been turned into a Tag Team Specialist and has only had one serious championship run in his tenure with the company. Dean Ambrose has been on the shelf so long that he will need time to work his way back into the title picture. The most intriguing name could be Elias but with his new album coming out and his tweets at The Rock, a major championship run seems like a stretch at this time. There was a fan poll online that had interesting results. It asked who you would book to take the Universal Title from Brock. The surprising winner was Curt Hawkins. They had Lesnar retaining at Summer Slam and coming to the following night’s Raw to throw down an open challenge with Hawkins accepting and eventually winning due to outside interference. I am not in favor of doing that after the backlash from the Jinder Mahal championship run on Smackdown last year but it is interesting nonetheless. Perhaps the answer to this conundrum is something we have seen in the past. If WWE thinks Brock Lesnar is leaving for good, then maybe the proper send off is an appearance on the Monday after Summer Slam by a former opponent who will stand up for WWE. Maybe a challenger with previous history with Brock would be the best selection. Maybe a star moving from Smackdown who comes in at the last minute to stand up for the WWE Universe who want their champion. This leaves us with four choices. The Undertaker has a long and storied history with Brock Lesnar. He could show up on the Raw after Summer Slam and challenge for the title. Him taking the Universal Championship from Brock would be poetic as Brock ended the Undertaker’s streak. They have amazing chemistry and would be an instant pop in the rating. Can’t you imagine the internet wrestling community going crazy if word gets out that the Undertaker is backstage at Raw? Despite how special the moment would be both for the loss by Brock and for Taker getting the Universal Title for the first time, WWE needs to shy away from part timers as champion for a while and build the championship to the level it needs to be if it is to be the #1 championship in the company. John Cena is another talent who has had so much experience with Brock Lesnar. He has never avenged his loss of the WWE Championship due to repeated suplexes and this would send Brock away with Cena being vindicated. Fans claim WWE has to stop pushing Cena. John Cena hasn’t had a meaningful win in years. His 16th Championship was a joke as he was used as a transitional champion for a month only to set up the Bray Wyatt vs Randy Orton feud. He has not been the focal point of anything in WWE in such a long time. He himself has stated that he can’t do this forever. If he is ever going to break Ric Flair’s record, this would be the perfect time to do it. Unfortunately, as was the case with the Undertaker, John Cena is a part timer and they need to have a full time champion carrying the Universal title. The one option that pretty much everyone may have overlooked would be for Brock and Paul Heyman to come out and issue the open challenge and have nobody answer. Brock could call out Kurt Angle and bash him for not finding him a suitable challenger on his last night in WWE. he could run Angle down about how incompetent he is as a General Manager. You could have Stephanie McMahon show up and threaten his job if he doesn’t find an opponent to beat Brock before the night is over. Towards the end of the show, Brock, Heyman, and Stephanie could be in the ring and call Angle to the stage to fire him for not finding an opponent. Angle could cut her off and say that he has found a challenger. One who is a far better wrestler than he is a general manager. Angle could pull off his suit to reveal his wrestling gear and Kurt Angle himself could be the one to take the Universal Championship from Brock Lesnar as he leaves WWE. Once you have exhausted the Raw roster, you have to look outside the box for who could come in and make the impact you really would want to have. At the same time, you want someone the fans can identify with and who they will accept. That means not Roman Reigns. To appease the audience and to send them home knowing they saw something they thought they would never see, you have the Raw after Summer Slam to give them a true moment in history. Brock could easily come out and throw out his open challenge. They key here is to have him throw out the challenge at the onset of the show with no Raw Superstar accepting. Paul Heyman could cut promos throughout the show about how there is nobody left on the Raw roster to challenge the “Beast”. Near the end of the show, Brock should walk to the ring and announce his exit from WWE as the Universal Champion. Paul Heyman could proclaim that since “not one WWE superstar has the guts to challenge Brock Lesnar” that he is taking the WWE Universal Title to the UFC. With Heyman preparing to leave with Brock, Kurt Angle could come to the top of the ramp and announce that he has a challenger for Lesnar for the Universal title and that the match will start “Right Now”. Cue the music for Daniel Bryan. A match between Daniel Bryan and Brock Lesnar has been a dream encounter for years and this is potentially the last time we may ever get to see it. Daniel Bryan moving to Raw to capture the Universal Championship would instantly bring legitimacy and excitement to the brand and would bolster the reputation of the championship as a whole. The only issue is WWE missing out on so many amazing match combinations he could still have on Smackdown. He has yet to have a solid program with AJ Styles, Shinsuke Nakamura, Jeff Hardy, Samoa Joe, or even Eric Young. He still hasn’t faced the Miz but it seems inevitable that the two will do battle at Summer Slam. Would WWE sacrifice those feuds to have this one “Dream Match” with Lesnar. Absolutely! Should they? Absolutely! Will They? Absolutely Not! In the End, the WWE Universe will see one of a few things happen. Most likely, Roman will be the new champion after Summer Slam because Vince decided that over a year ago. If not Roman, then Braun will cash in and be the man. If neither of those happens, Brock will keep the belt and attempt to win the UFC Heavyweight Championship as well with the understanding that he will appear for both companies. All of the other options are long shots at best and more wishful thinking. What may be the most frustrating is that WWE creative has had months to come up with compelling storylines heading into this situation and I would wager that they have not considered even half of these options. Perhaps that is the issue with WWE today.